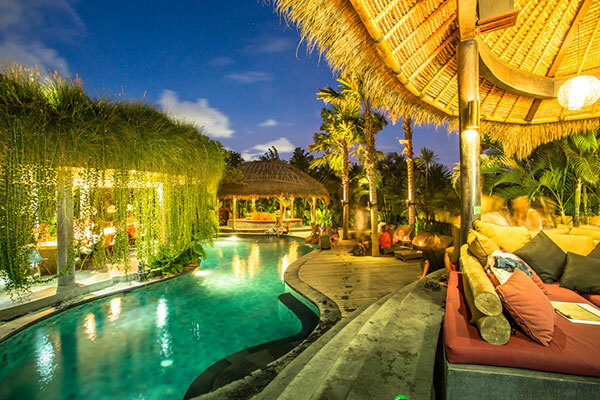 The Green Room Canggu is situated amidst rice paddies at Bali’s west coast, about 15km north of Seminyak, only a stone’s throw away from the beautiful Canggu beach. You have a great sea view from the upper floor, and some nice bars and restaurants in walking distance. The famous surf spot Echo Beach can be reached in a short walk. Far from the madding crowds of the tourist strongholds, here, surrounded by rice fields and palm groves, it is so easy to slip into a chilled rhythm enjoying the spectacular sunset from the comfort of our Hotel. If the mood takes you, you can hit Seminyak or Kuta for a spontaneous shopping trip. In the laid-back Green Room Canggu you have all the options. 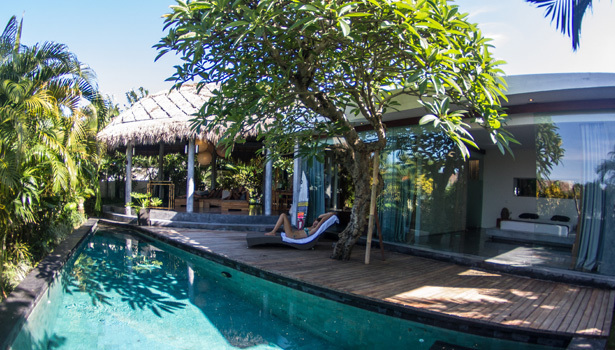 For your comfort and to let you really enjoy your holidays we have made every effort to create a genuine Bali feeling in our choice of accommodation. A laid-back, relaxing holiday is guaranteed here in the midst of rice fields, just a stone’s throw away from the water. The Robinson Crusoe design of the hotel ensures you experienced island lifestyle at its best. From the terraces and the entire complex you have a fantastic view over the sea and the 2 surf breaks right on your door step. 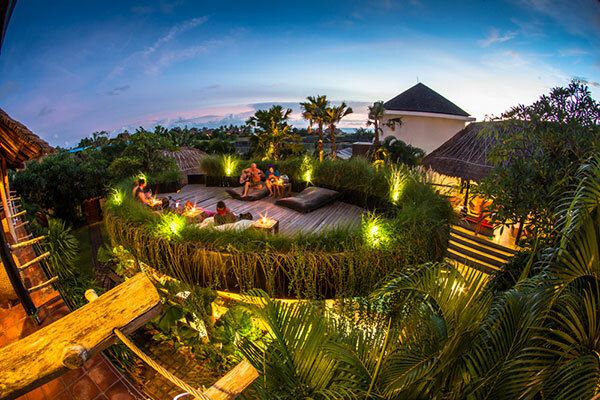 Our traditional Bali houses with HiFi/DVD, the beach bar and the fantastic vista make it the ideal place for hanging out between surfing, relaxing, dining, whatever you fancy. It goes without saying that there is a W-LAN Internet connection available for all our guests free of charge. If you wish to explore the Islands treasures, such as the famous Hindu temples, national parks or beautifully remote beaches feel free to book a tour with our friendly drivers and see a different side of Bali, the Island of the Gods. Two Deluxe suites offer extra comfort. Divided in a bed and a sitting room, they are equipped with TV/DVD, and a transparent glass wall, thus offering a stunning view to the Indian Ocean. A non-transparent curtain guarantees you enjoy privacy if you wish to. The two luxurious private villas come with air conditioning, flat-screen TV, Hifi/DVD/iPOD station, an open bathroom with shower, a kitchen and chill area. 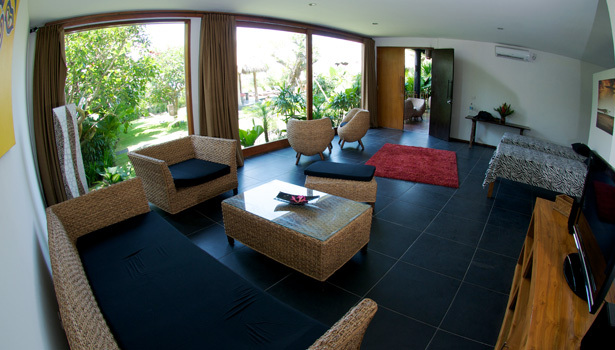 These villas are separated from the hotel complex and have their own private pools and small tropical garden.